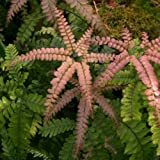 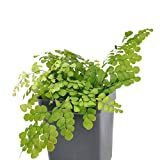 Adiantum philippense growing fern rhizome of the genus Adiantum also known as Maidenhair fern, Adiantum philippense perennial evergreen or cold deciduous used as ornamental plant, grow in tropic climate or as houseplant and growing in hardiness zone 12+. 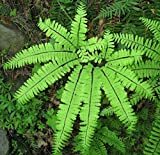 Leaves color green, leaf shape half-moon, leaves grow in pinnate structure in triangle. 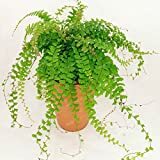 LITTLE LADY MAIDENHAIR FERN, ADIANTUM MICROPHYLLUM, PLANT SHIPPED IN 4" POT!